We are open tonight from 730-10 - cone out and enjoy the shorter lines and cooler weather! #howtohouston #HalloweenIsComing #houstonhauntedhouses #dontstayhome Follow screamworld on Instagram: https://www.instagram.com/p/BLzc1hPgaZ_/ Post your ScreamWorld pics to Instagram using #screamworldtx to have them show up here. Our Last Discount Night - Beat the crowds! Tonight (Sunday, 10/16th) is our last discount night of the season. www.screamworld.com/tickets @screamworlds_beaztie #howtohouston #HalloweenIsComing #discountnight Follow screamworld on Instagram: https://www.instagram.com/p/BLotLzsgYGi/ Post your ScreamWorld pics to Instagram using #screamworldtx to have them show up here. 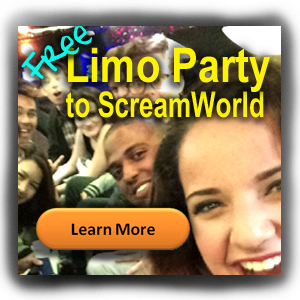 Congratulations to our Limo Ride To Fear winners! Thanks for entering and come see us again. #howtohouston #limoridetofear #screamworld #screamworldhouston Follow screamworld on Instagram: https://www.instagram.com/p/BLoh5VHg4F2/ Post your ScreamWorld pics to Instagram using #screamworldtx to have them show up here. Open until Midnight tonight and 7-1030 on Sunday. #howtohouston #houstonhauntedhouses #isthattwitchy Follow screamworld on Instagram: https://www.instagram.com/p/BLm9MSqge34/ Post your ScreamWorld pics to Instagram using #screamworldtx to have them show up here.